Budget 2016 and its aftermath has given a window into the politics of the Conservative Party as Britain counts down to the EU Referendum (June 23rd). The plan was supposed to be for George Osborne to play ultra safe in the run up to the vote, but he appears to have been well and truly duped by Ian Duncan Smith (IDS), Britain's welfare minister who apparently whilst in agreement with the proposed benefits cuts before the budget speech that includes £1billion of cuts for the disabled. Instead now, suddenly after 6 years in the job of delivering benefits cuts he apparently has developed a conscious and decided to resign as he cannot go along with the latest series of cuts. 1. BrExit - Whilst 50% of the Tory party wants to pull out of Europe, the other ruling 50% wants to stay in, and IDS was one of the few BrExiters in government who could do damage to the governments cause and so now he has, whilst at the same time also doing huge damage to George Osborne's chances of taking over from David Cameron as he reiterates Osborne's failures across the broadcast media. 2. Universal Credit - IDS's flagship mega benefits change which despite all of the cost of 6 years of work in trying to implement has turned out to be a total disaster. So it looks like IDS after 6 years of failure just gave up and chose to resign before being reshuffled out of the cabinet. And these are the probable reason for IDS's resignation, facing a Universal Credit disaster coupled with wanting to damage the government in the run up to the BrExit vote which I will come back to towards the end of this article. The primary focus of this article are 3 significant announcements in the budget of UK borrowing, Lifetime ISA and the weakening UK economy in a series of 3 videos, before I look at Syria & BrExit and finally the stock market. 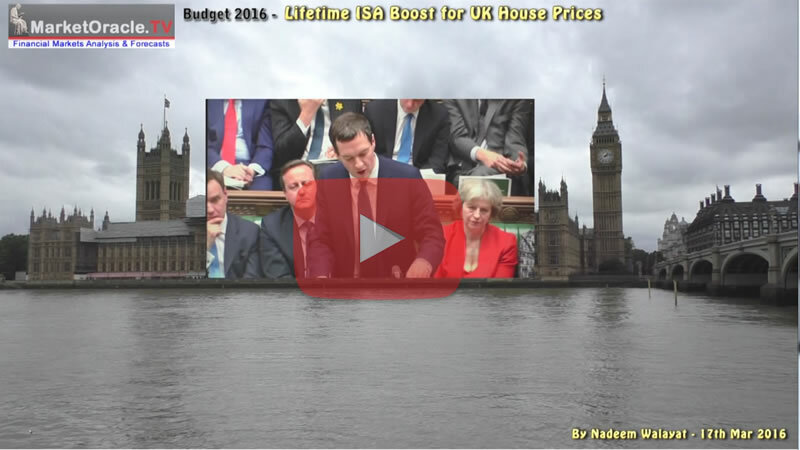 George Osborne's Budget 2016 speech once more had the OBR dutifully pump out economic propaganda for the UK government, where the most notable revision was to increase the amount the government will borrow over its term in office from the original £115 billion (May 2015) to now £178bn, a 54% increase on the amount they said the government would borrow at the outset, and which is set against their November 2015 revision higher to £143bn. 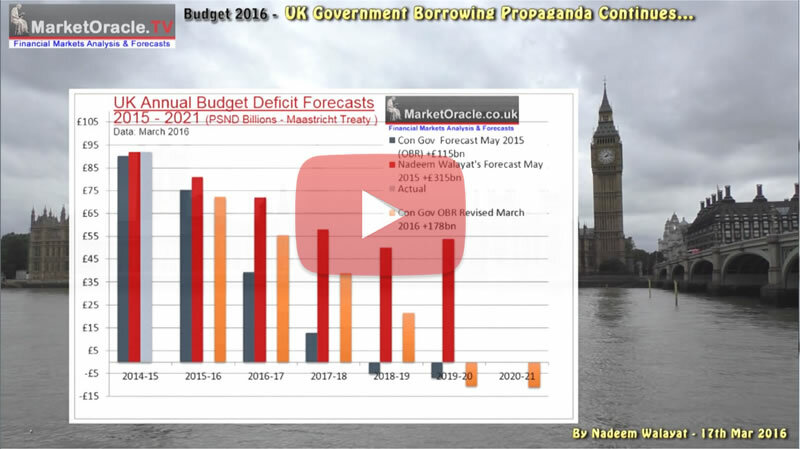 However my original analysis forecast of May 2015 warned to expect far, far higher borrowings than anything that the economic propaganda mouthpiece of the government (OBR) was pumping out at the time or today, find out in this video analysis. George Osborne's flag ship personal savings account change of Budget 2016 is the announcement of the Lifetime ISA. Which is the latest of a myriad of policies aimed squarely at stoking UK housing market demand, effectively QE for first time buyers as the government seeks to hand out £1,000 for every £4,000 saved as long the monies are used to either buy ones first home or to fund retirement. 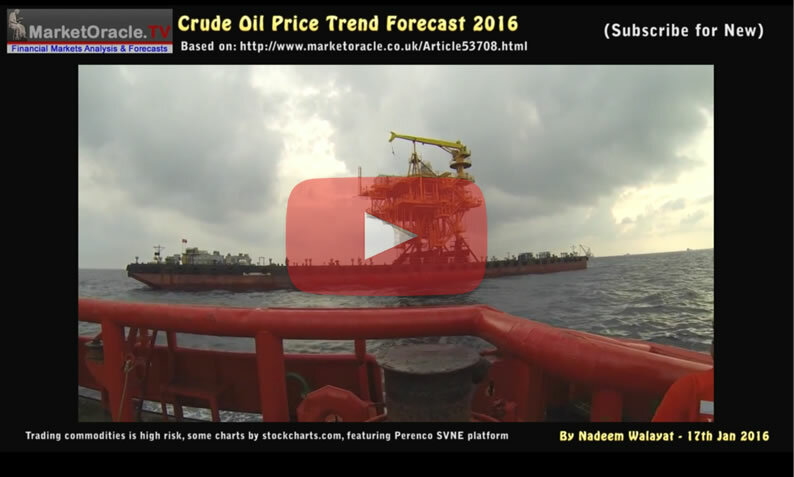 details in this video analysis. 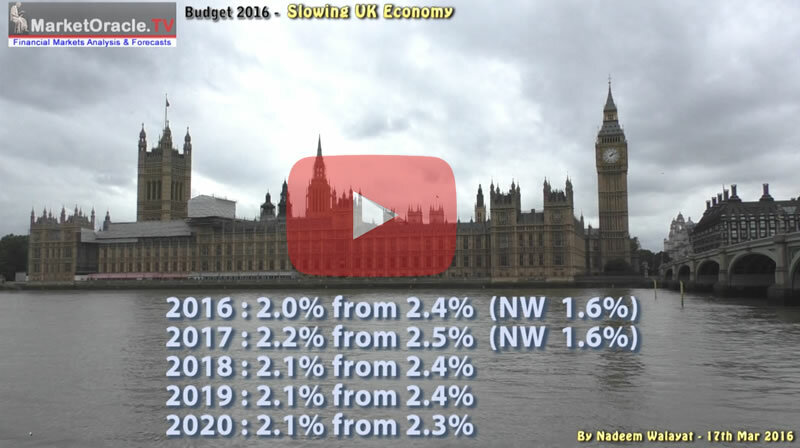 George Osborne's Budget 2016 statement revised lower the governments fantasy projections on the economy by their Office for Economic Propaganda (OBR), that nudged expected growth lower for 2016 and 2017, however, which significantly still over estimates that which is most probable as explained in this video analysis. This week marks the fifth anniversary of Syria's civil war, that started with Arab spring inspired protests in the city of Derra, that within months engulfed the whole nations and which to date has seen over 450k people killed and 4 million externally displaced as pawns in the games of dictators such as Assad, Putin and Erdoğan of Turkey who today succeeded in black mailing europe into giving access to 80 million Turks for Syrian refugees, and then there is the shame of the whole of eastern europe who having flooded the west with 15 million economic migrants in return closed their borders to refuge seeking syrian refugees. See how Syria's civil war began and raged for 5 years, the hypocrisy of eastern europe and why Britain urgently needs to exit the european union before it disintegrates. The bottom line is that the so called deal with Turkey is the final straw that broke the camels back and come June 23rd the people of Britain will say enough is enough and vote to LEAVE the European Union. So forget all of the worthless opinion polls that still put the REMAIN camp about 10 points in the lead, the mainstream press pundits and vested interests and understand this that Britain WILL vote to LEAVE the EU! And lastly a look at the stock market. The supposed great bear market of 2016 keeps on trending in the WRONG direction as the bears latest hopes for an imminent bear market apocalypse, the March Fed meeting on which they hoped to be raptured into perma-bear heaven following a second rate hike in this series, instead resolved in the exact opposite outcome, with not only the Fed keeping interest rates on hold but issuing a dovish statement on the future prospects for US interest rates which apparently caught many by surprise. What's the surprise? When over a month ago we saw BoJ panic!, and only a week ago we saw the ECB panic of negative interest rates! I could go on at length with why the Fed, BoJ, ECB and BoE are clueless and what they actually should be forced to do for it will take force because they only tend to print trillions to save and support their bankster brethren and of course inflating asset prices at the expense of the purchasing power of earnings of the wage slaves, but I will save this for another article. Nevertheless the stock market dutifully climbed higher on the Fed decision and closing on Friday at Dow 17,602, positive for the year and within 4% of its all time high of 18,351. So the bears are blaming the Fed for the failure for stocks to fall, and if its not the Fed then its the corporate's for buying back their own stock, or that the markets are manipulated! All without understanding the fundamental fact that the MARKET is the sum of ALL of these actions and the only place that this can be seen to become manifest is in the PRICE, just as I stated in March 2009 right at the beginning of this stocks bull market! The bottom line is that at least 90% of market commentary is written by either journalists or the financial sales industry trying to sell you a product or service, and this rally is doing a good job of exposing those who are consistently wrong because they clearly DON'T TRADE OR even INVEST for if they did then they would have already BANKRUPTED themselves several times over by now!